This year we're doing a big family Christmas at my Uncle's house! I'm going to be making a dessert (or two) so I have been trying out different recipes over the past few weeks to decide on what I should bring. Nothing says Christmas quite like Gingerbread I think! 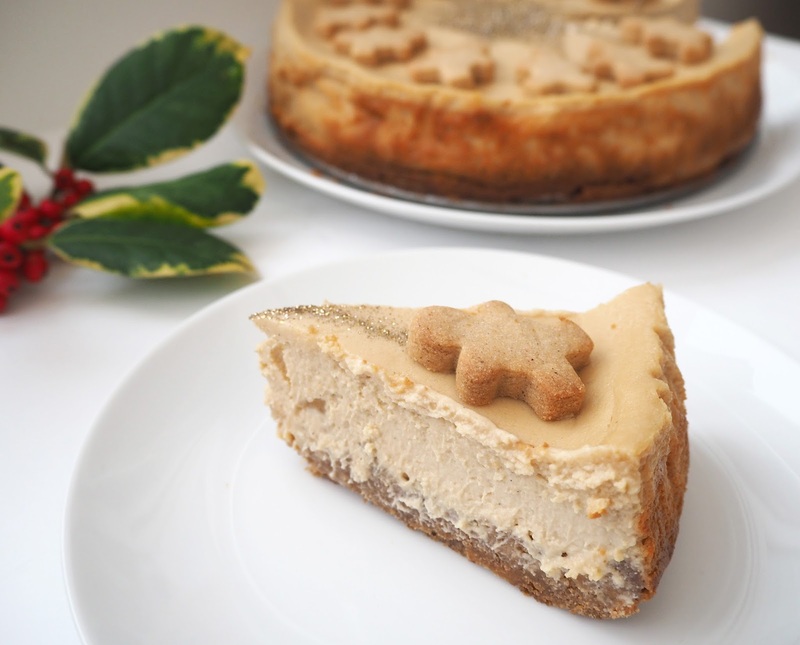 So when I came across this Gingerbread Cheesecake Recipe in one of my Great British Bake Off books I thought it could be a good option. 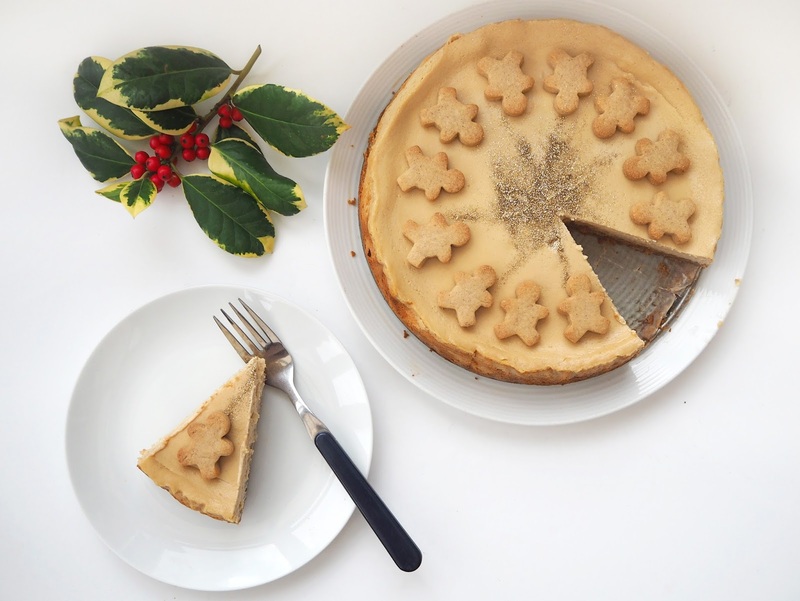 Note: This recipe originally contained coffee liqueur & a tablespoon of coffee granules making it actually a Gingerbread Latte Cheesecake. Now I'm not a massive fan of coffee in baking unless it's with chocolate and I really just wanted it to have a festive gingerbread flavour so I left out the coffee liqueur (I thought this would really overpower the whole thing!) and only used a teaspoon of coffee granules to just enhance the flavour of the spices. However if you wish to add them into your bake then I have listed the amounts in the ingredients below. The original recipe is taken from this book. I made my own Gingerbread Men using my own favourite recipe (easy to find one online) and a miniature cookie cutter. 1. Pre heat the oven to 150C/300F/Gas 2. Crush the biscuits in a food processor or by putting them in a plastic bag & bashing he with a rolling pin (my preferred method!). Tip into a bowl & stir in the melted butter until thoroughly combined. Transfer the mixture to the prepared tin & press on to the base with the back of a spoon to make an even layer. Bake in the heated oven for 10 minutes. Leave to cool while you make the filling. 2. Put the cream cheese, soured cream, eggs, sugar and vanilla extract (or vanilla paste) into a food processor and blitz until the mixture is very smooth & creamy. Transfer 200ml to a measuring jug and set aside for the topping - I wasn't sure what the point of this extra 'topping part was as it didn't seem to add much to the final dish so personally I'd say this bit for optional! - Dissolve the coffee in boiling water, then stir in the coffee liqueur (if you're adding it). Add to the mixture remaining in the processor along with the glacé ginger then 'pulse' a few times until thoroughly combined. 3. Set the spring clip tin on a baking tray (this is in case so of the mix leaks out during transfer or cooking which a little of mine did). Pour the cheesecake filling on top of the biscuit base. Place the tin, on the baking tray, in the heated oven and bake for 1 hour - the cheesecake filling will still 'wobble' if you gently jiggle the tin but the top should be just set. Remove the cheesecake, still on the baking tray, from the oven. Starting in the centre, carefully pour the reserved creamy white filling mixture on top, if possible leaving a 1cm boarder of coffee-coloured filling showing around the edge (this is almost impossible by the way I just smoothed it over all of it!). 4. Return the cheesecake to the oven and bake for a further 20-30 minutes (I did exactly 25 minutes for mine) until the filling had just a slight wobble. Turn off the oven and leave the cheesecake inside, with the door slightly ajar, to cool for 1 hour. 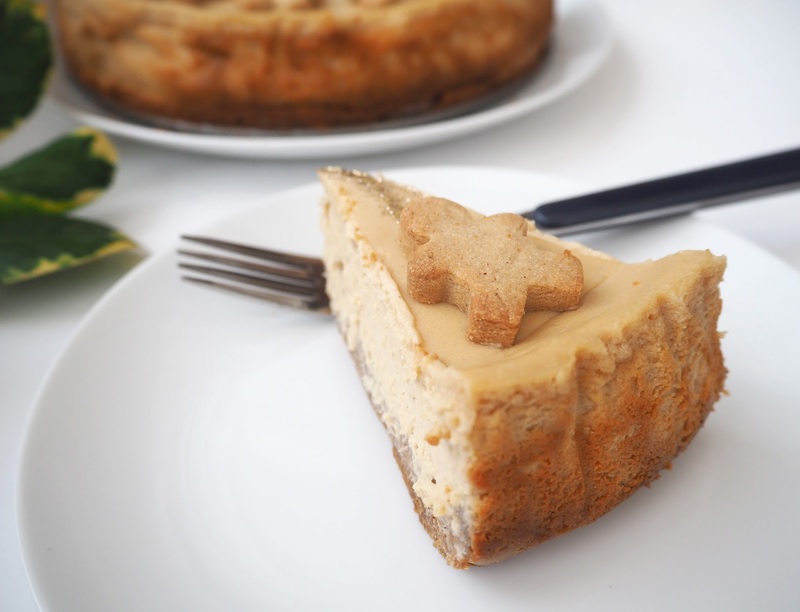 After this time, remote the cheesecake from the oven and run a round-bladed knife around the inside of the tin to loosen the cheesecake, then leave to cool completely. Once cold, cover with cling film and chill overnight. 5. Unclip the side of the tin and set the cheesecake on a serving platter. Decorate as desired, for example dust with cocoa powder, use a stencil or like me you could use edible glitter and mini gingerbread men biscuits! Keep any leftovers in the fridge. It turned out really delicious and as I had only added a little coffee it just had a hint of coffee flavour which I think just enhanced the ginger spices even more. The only thing I thought though was it did turn out pretty dense in texture. Which isn't ideal for a post Christmas meal I don't think. I have read that whipping the eggs or just the egg white separately then folding them in might help so I may try that next time. Does anyone have any ideas on how I could make the texture lighter and fluffier? If you make this then please tag me on twitter and Instagram, I'd love to see your creations! I'm @katiekirkloves on both. 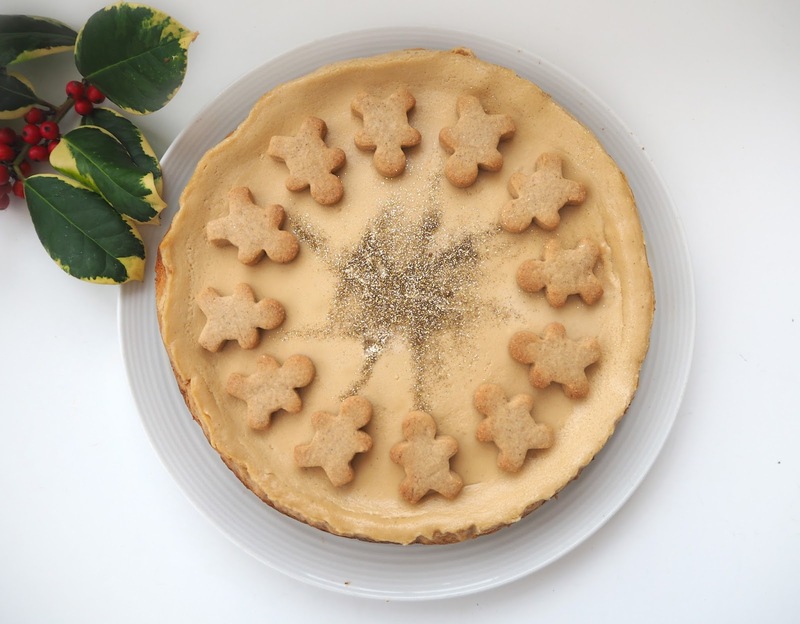 What will you be having for your dessert on Christmas Day?